With National Fishing Month now upon us, safety advisers at Western Power Distribution (WPD) are urging anglers to look up and look out for overhead power lines when fishing. Many fishing rods and poles are made from carbon fibre and similar materials that conduct electricity, with others materials allowing electricity to flow along them when wet. If they touch or come into close contact with a power line, lethal electric currents could pass through onto you and lead to bad burn injuries or even death. 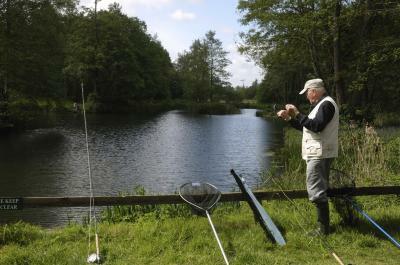 Eileen Leadley, Education Safety Adviser, said: “While people should enjoy angling, our electricity cables contain high voltages of electricity that can kill. Please stay safe and look out for the yellow danger of death signs fitted to wooden poles or pylons. Always be aware of your surroundings and remember to look up and look out before casting off. “Be sure to unpack, set up and put away your rod at the water’s edge, while observing the warning signs and instructions, even in the car park or at the roadside. - Tell the fishery owner about any dangerous situations or near misses that you see. - If you see a fishing line tangled ov overhead power lines, do not try to touch it or pull it down. Report this to Western Power Distribution straight away. - Do not attempt to move the fishing equipment or person if either is still in contact with, or close to, the overhead power line. - Electricity lines may stay live after contact or may be re-energised automatically or remotely without warning. - Prevent third parties from entering the incident area. - Maintain a 5 metre distance. - Call the Emergency Services on 999 and request an ambulance, if required. - Contact Western Power Distribution on 0800 6783 105 so that the power line can be made safe. For more information, read our dedicated angling safety leaflet by clicking here.